Galleria Lorcan O’Neill Roma is happy to announce its first solo exhibition with Martin Creed, English artist who won the Turner Prize in 2001 with The lights going on and off (an empty room illuminated by the lights being switched continuously on and off). Creed's exhibition in Rome will show a series of new wall paintings specially conceived for the gallery, which turn it into a multicoloured pinstriped space where the viewer looses his conception of volume and gravity. 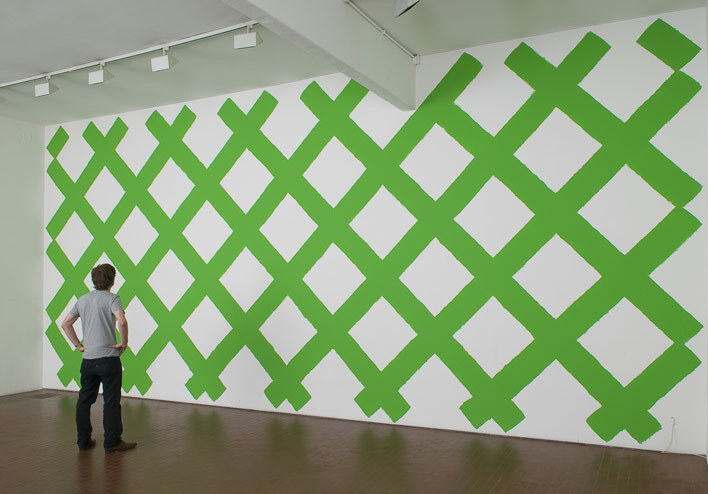 In these wall paintings, each mark and each colour follows a strict and rigorous mathematical order which, once the painting is complete, seem to be completely denied. The show also includes a group of small drawings and paintings, whose strong marks emphasizes the infinitive range of possibilities a common pen presents. Rigorous geometrical shapes, stripes and colours can be seen as essential works with many different meanings. A neon, Work no. 895. Feelings, is made of several different colours, using a different tone for each letter in the word. The work makes a simple and clear statement about "feelings" as a common word that embodies a wide ranage of emotions; and yet when read in the cold light of a tubular neon, its own generally warm meaning is contradicted. The photograph Work no. 763. Orson and Sparky refers to an exibition Creed did in Los Angeles in 2006, where two unusually large and small dogs accompanied viewers during their experience of the show. The Multicoloured scene in the gallery casts light on Martin Creed’s protean artistic language, which includes sculpture, painting, photography and film, installations and music performances. His works come from natural thoughts, feelings and instincts, translated into minimal marks and gestural imprints. The impalpable, unexpected and contradictory assume shapes, colours, sounds as well as numbers. Every work comes from ordinary or unexpected objects like blue balloons, standard A4 papers, beans, bags, or lamps. His bright neon works are very simple and text-based, and allow both irony and literal meaning to play a fundamental role. During his staying in Rome, the British School at Rome will host Martin Creed on Tuesday 27 May 2008 at 18:00 for a presentation of his work in a talk.